We are proud to share with you our feature in Capital magazine, the most popular business magazine in the Germany. We were asked for an interview about the current charter market and the empty legs. Our firm has started exactly ten years ago during the financial crisis. Since then we have been improving our personal charter service and have developed the Call a Jet App where you can book your flights easier than ever. Our team offers you a wide range of jets & propeller planes from small to large to satisfy your wishes in every detail any time. Take advantage of the best service for the most favourable price. 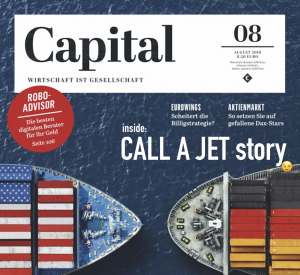 Please read the article about our story , our work and the trips we sell in the new edition of Capital Magazine (out 19.07.18). You can find our whole story in ‘Der neue Jetset’.